People think that playing Go will develop your logical thinking power, that is, the skill used to calculate out sequences. Sometimes they say the effect of playing Go is getting a logical mind, other times the effect of having a logical mind is falling in love with Go. At least this is the usual feeling in Europe’s Go community. Surprisingly I’ve met some professional and really strong Go players that don’t look like a “logical mind” at all. They are emotive, they make silly mistakes, or just in a word: they are “normal”. Actually, Go develops a lot of different parts of the brain, and not only the logical skills, despite what we usually think in Europe. · Opening (fuseki): Building territory frameworks develops spatial sense. · Corner patterns (joseki): If you study the reasons of the moves (in theory the best moves for both sides) you will get better comprehension and memory. · Tesuji and life and death problems: Finding the vital point of shapes helps your logical thinking power, but also your intuition. · Middle game: While deciding which battles are the correct to start you work your judgement ability. Of course, your creativity and your adaptability is highly stressed too. · Endgame and final score: Counting the value of the last moves of the game, and counting the final score, helps your mathematical abilities. · Game review: Replaying the game develops your memory (patterns). So a lot of parts of the brain are touched, from left to right sides. As a brain exercise, Go is a quite complete activity. 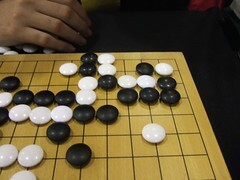 Compared to other so-called brain-helper activities, like solving sudokus, it’s obvious that Go is far better. Only complex games like Chess can be a subject of comparison. P.S: I’m in love with Korean baduk books. In Europe we get only Japanese books, translated to English, and most of the time they focus on “the magic”, explaining things without order. Korean books, however, have an extremely good methodology! But how do you read korean…? You were not there that long, were you?? No, I can not read Korean. Anyway, the quote comes from an English-language Korean-published book for kids, Level Up #4, by Baduktopia.